The firm deals with divorce cases, child custody, domestic violence, drafting of agreements between partners including prenuptial agreements, wills, inheritances and any additional issues in family law. Our firm has extensive experience representing clients in litigation proceedings in the field of civil and commercial matters. The firm specializes in various aspects of real estate, including real estate transactions, registration of the relevant registry and real estate taxation. The firm accompanies its clients in an intelligent and sensitive manner from the stage of investigation and arrest, while in talks with the authorities, to the court hearing, including the appeal process. Our perspective is that the client should always be the center of our attention. We are aware that common rights and legal procedures are often unknown to the person seeking counseling or legal advice. Therefore, we firmly believe in full transparency and usher our clients step by step through any legal procedure, and even afterward, while keeping the client regularly informed with respect to any progress made. We do our work by maintaining the values of excellence, professionalism and paying attention to details, to provide our clients with the highest level of service. We are available to our clients with any question, request or problem, big or small, our team provides personal care with respect to the client’s specific needs. Our professional experience enable us finding tailor-made creative solutions, in a wide range of legal fields, while retaining quality service and finding an overall solution, whilst maintaining professional integrity, discretion and confidentiality. 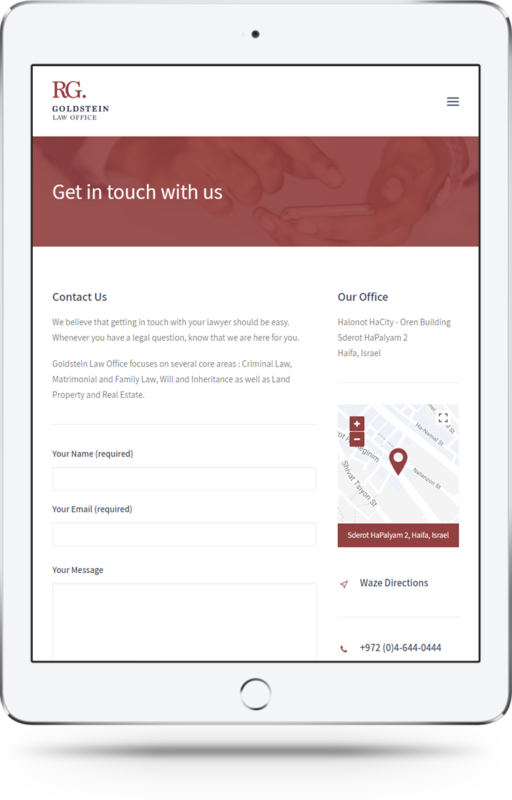 Our firm offers its clients legal advice and representation in a wide range of legal fields. Our broad knowledge of relevant fields and our expertise in law provides us the possibility to offer a diversity of creative legal solutions, within a unique mindset, in order reaching an ultimate solution for our clients, this following their needs and the circumstances of the case. Our clients base consists of a variety of companies in different businesses, organizations and individuals at all relationship levels, both for legal representation in need as well as for legal ongoing support in various matters. The solutions we offer rely on extensive experiences and profound professionalism in our work environment proficiency. Our firm is meticulous in bringing on strong lawyers, with a great intellect and abilities, helping to reach the optimal solutions in order protecting the client’s rights by law and achieve their personal and professional objectives. Whenever you have a legal question, our team is here for you. I met Roey at a difficult moment, at the beginning of the divorce process. I have met a person whose work is beyond the task to be filled, and customers for whom they are beyond what they pay. I have met a person who comes with the whole soul, accompanies, supports and is always available and free to respond. A few months ago a young man came to my guest rooms and suggested that I advertise my bed-and-breakfasts with him on the site ... Unfortunately, in practice, he took my checks and disappeared. [...] Fortunately, thanks to my dear daughter, Yasmin, I met a great lawyer! My lawyer, Roey Goldstein, showed me that there was something to do and immediately went into action. Thanks to my lawyer Roy Goldstein, who helps me fight for everything without compromise and gives me the strength to believe in my rights, accept them and most importantly - succeed !! Get the latest from Goldstein Law in your inbox.